The graph shows the value in thousands of dollars of three companies selling farming equipment every five years from 1960 and their projected value from 2007 to 2012. Farming Implements Ltd did not start trading until 1980. Hi! Could anyone grade my graph? The graph shows the value in thousands of dollars of three companies selling farming equipment every five years from 1960 and their projected value from 2007 to 2012. Farm Implements did not start trading until 1980. The graph illustrates the value in thousands of dollars of three companies selling farming equipment every five years from 1960 and their projected value from 2007 to 2012. As can be seen, there was a gradual increase in the value of Greenacres Ltd from 2 million dollars in 1960 to 4 million dollars in 1990. It means given company doubled its value twofold. It is apparent from the graph that, from 1990 to 2000 the value of given company fell from the outcomes of the 1990 to 2 million dollars. Like Greenacres Ltd, Farm Implements Ltd. which commenced its trading dealings in 1980, showed an upward tendency in selling of farming equipment from 1980 to 2000 gaining 3 million dollars that was three times as much as it was in 1980. 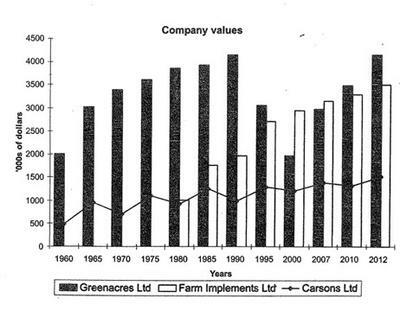 Over the years there were slight fluctuations in the value of Carsons Ltd. In 1960 the amount of its value made up 500,000 dollars. Generally, it showed an upward trend until 1995. Between 1995 and 2007 the figures almost remained constant. Overall, the projected value of given companies went up progressively. In 2012 Greenacres Ltd. and Farm Implements Ltd. demonstrated an upward tendency, reaching the highest peak of 4 and 3,5 million dollars respectively. There was also an increase in the projected value of Carsons Ltd, accounting for 1,5 million dollars.